This image shows the west-facing side of an impact crater in the mid-latitudes of Mars' northern hemisphere. The High Resolution Imaging Science Experiment (HiRISE) camera on NASA's Mars Reconnaissance Orbiter took the image on April 13, 2010. It is one of 600 recent HiRISE observations newly released to NASA's Planetary Data System. 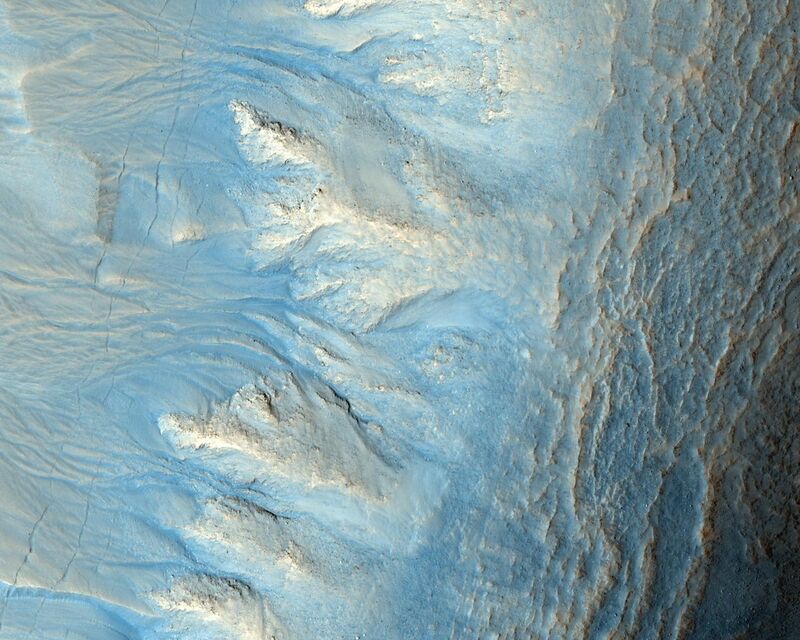 Like many mid-latitude Martian craters, this one has gullies along its walls that are composed of alcoves, channels and debris aprons. The origins of these gullies have been the subject of much debate; they could have been formed by flowing water, liquid carbon dioxide or dry granular flows. 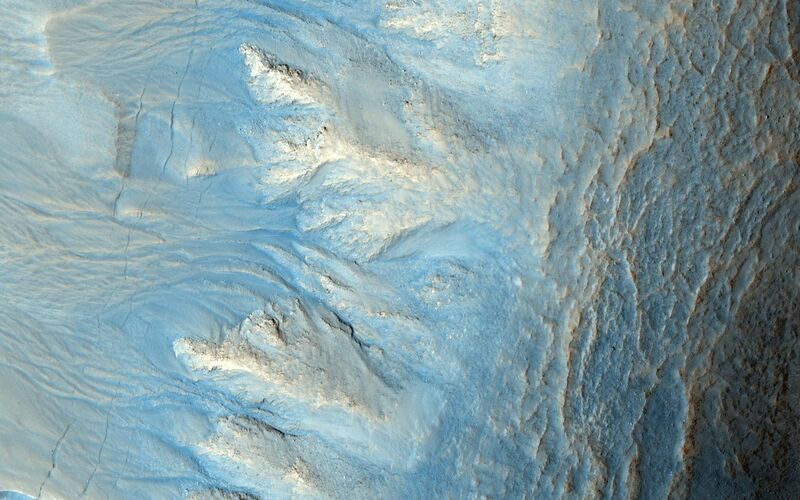 The orientation of these gullies is of interest because many craters contain gullies only on certain walls, such as those that are pole-facing. This could be due to changes in orbital conditions affecting long-term climate cycles and differences in solar heating along specific walls. Another sign of ice is the presence of parallel lines and pitted material on the crater floor, similar to what is referred to as concentric crater fill. Parallel linear cracks are also observed along the crater wall over the gullies, which could be due to thermal contraction of ice-rich material. All of these features taken together are evidence for ice-rich material having been deposited in this region during different climatic conditions, material that has subsequently begun to melt and/or sublimate under current conditions. More recently, wind-blown deposits have accumulated around the crater, as evidenced by the parallel ridges dominating the landscape. Dust devil streaks are also visible crossing the wind-sculpted ridges. This image spans a distance of about 1.2 kilometers (three-fourths of a mile) and is presented in false color, which aids in distinguishing among surface materials and textures. 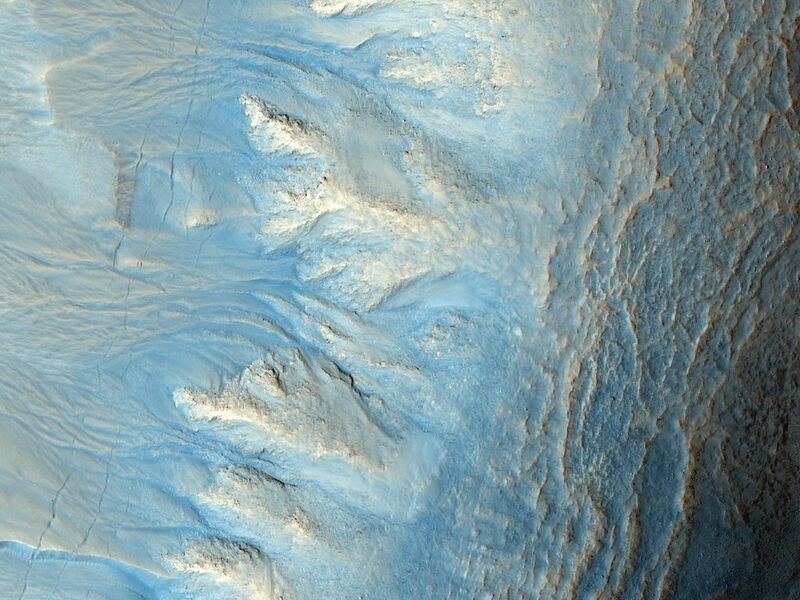 It is a portion of the HiRISE observation catalogued as ESP_017405_2270, of an area centered at 46.7 degrees north latitude, 90.2 degrees east longitude. Other image products from this observation are available at http://hirise.lpl.arizona.edu/ESP_017405_2270.